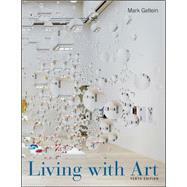 Living with Art'sapproach to art appreciation supports students' acquisition of the essential skills of the course. Mark Getlein's vivid narrative, in concert with McGraw-Hill's powerful adaptive learning program LearnSmart within CONNECT Art, helps students understand, analyze, and appreciatethe ways art work communicates to us in our visual world. In doing so, Living with Artprovides the foundation for a life-long appreciation of art, as well as critical thinking skills that will benefit students far beyond the classroom into their chosen careers. Students are invited to actively join in the discussion from Chapter 1. The narrative engages them in the stories of art, while the integrated digital assessments in CONNECT Art challenge them to build a fluency in the core vocabulary of the course; practice applying it in guided writing assignments; and ultimately prepare for active class participation and success on critical analysis, studio, and museum assignments. The result is greater engagement and greater course success. The result is greater engagement and greater course success. Painting and Beyond: Off the Wall! THINKING ABOUT ART: Whose Grave? Art since the Eighties: Postmodern World?